Telangana State Model School Entrance Test hall tickets 2019 released, TSMS Entrance Test Hall tickets. 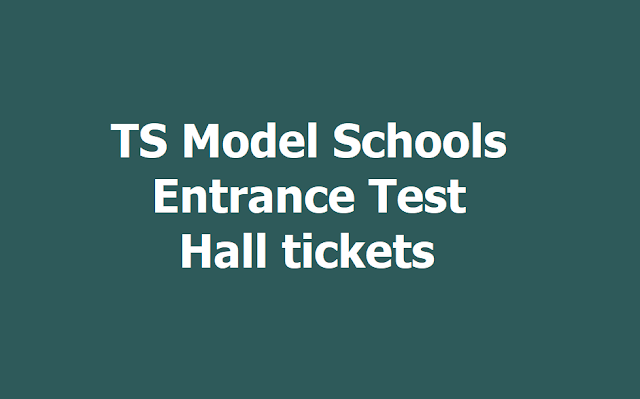 TS Model Schools Entrance Test Hall tickets 2019, TSMS Entrance Exam On April 18: Telangana State Model School Admission Test hall tickets 2019 are released. Telangana State Model School (TSMS) has released hall tickets for 6th, 7th, 8th, 9th, 10th Class Entrance Exam 2019. Candidates can visit the official website of TSMS- telanganams.cgg.gov.in- to download the hall ticket. TS model school entrance examination is going to be held on April 18, 2019. Students who qualify this entrance examination will be eligible to get admission to Telangana State Model Schools classes VI to X and Intermediate. Telangana Model School Admit Card 2019 - Steps to download: Candidates who will appear for the exam can easily download the admit card or hall ticket through these simple steps. Visit the official site of Telangana Model School at telanganams.cgg.gov.in. Click on online hall ticket link available on the page. A new page will be redirected where candidates will have to enter their details like reference ID and date of birth or candidate name and date of birth or mobile number and date of birth. Your admit card will be displayed on the screen. Download the admit card and take a print out of the same for further need. Candidates should note that hall tickets can be downloaded online as per the reference number allotted. It is to be noted that no hall ticket will not be dispatched by post and shall be downloaded from the website. Candidates can download the TSMS hall ticket for entrance exam either from the official website or from the direct link provided below. The question paper for admission into Class 6 will comprise of four subjects- Telegu, mathematics, science & social (E.V.S) and English. For Class 7 to 10 admission, the question paper will comprise of English, Mathematics, General Science and Social Studies. The question paper will be of 200 marks. The selection of appearing candidates will be made as per the merit list.